This past July I had the opportunity to take a road trip out to Arizona to chase monsoon storms with my buddies Mike Olbinski and Mike Mezeul. A few days into the trip, storms began firing just minutes from our hotel in Tucson. 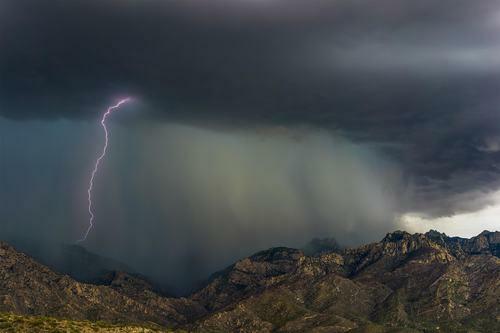 A ten minute drive from our hotel had us in front of a monsoon storm building over the Santa Catalina mountains. The storm was stationary and the clouds just kept building over the mountains with no precipitation whatsoever. We knew that as soon as it started dumping rain it would be a massive downpour; and when the bottom did finally fall out of the storm, lightning started striking all over the mountain peaks. Capturing lightning at night isn’t all that hard. It’s just a matter of knowing where to point the camera and setting up long exposures to give yourself the best chance of grabbing a strike. Sure, there’s some luck involved, but skill plays a significant role as well. During the day, everything changes. So without further ado, here are some tips for capturing lightning strikes during the day. It should go without saying that the more you can fit within the frame horizontally, the better your chances will be of capturing a strike. Unless there’s a high concentration of strikes in a small area, I’m usually photographing storms with my Sony Zeiss FE/16-35 f/4 lens. This lens is not only tack sharp, it also allows for an extreme wide angle field of view. I is by far my most often used lens for storms and landscapes. When photographing these slow moving monsoon storms, you don’t move around a ton (especially with lightning). You set up your tripod, find a good composition and shoot away until something happens where you need to move. What you don’t want to be doing is refocusing every time you want to take a shot. That’s why I always set my Sony a7 cameras to manual focus. Switching your a7 to manual focus will simultaneously set up back button focus as well. Just make sure the lever on the back is set to AF/MF and that button in the middle will now be your autofocus. This lets you set focus, and shoot to your hearts content. You need to give yourself the greatest chance of success by any means necessary. Safety is in numbers folks; so shoot in burst mode, spray and pray. I won't judge. 4) When you see a strike, react. What you’re looking for during the day (with or without a lightning trigger) is what’s known as staccato lightning. Staccato lightning is multiple lightning strikes in the same place, within a short amount of time. You’ve seen it before; a strike happens and in a split second several more duplicate and triplicate strikes happen in the same place. That’s staccato lightning. A lightning trigger will (sometimes) pick up that first strike and then set off the shutter to capture the subsequent strikes. Without a dedicated lightning trigger, your finger and cat-like reflexes will be your trigger. Just stand watch and when you see a strike, no matter where it is, squeeze down the shutter and hold it down to fire off as many shots as possible. How well does this method work compared to a trigger you might ask? Well, I was shooting alongside 3 other photographers and I was the only one who got this shot :-) Ok, full disclosure, they got plenty others that I didn’t, but that’s just the way it goes. I would say that for every 6-7 strikes the guys with lightning triggers got, I got around 4-5. Not quite as high a success rate, but not too shabby either. And I didn't have to dump $500 into a lightning trigger that I'll hardly ever use.